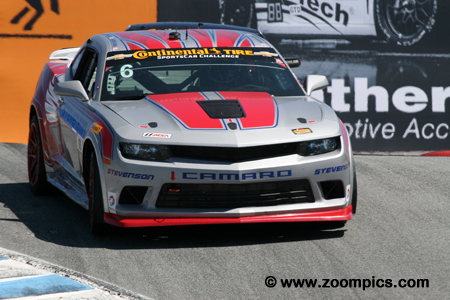 The 2015 edition of the Continental Tire SportsCar Challenge consisted of ten-events (Daytona, Sebring, Mazda Raceway Laguna Seca, Watkins Glen, Canadian Tire Motorsport Park (CTMP), Lime Rock, Road America, Virginia International Raceway, Circuit of the Americas and Road Atlanta) for showroom stock cars. The races were 2-hours, 30-minutes in length. The cars were relatively unchanged from their road going versions – modifications were mandated primarily for safety – roll cages, window nets, etc. They were also required to use tires provided by series sponsor Continental. Grand Sport (GS): The quicker of the two groups, this class included cars such as the Chevrolet Camaro GS.R, Ford Shelby GT350R-C, Aston Martin Vantage, Nissan 370Z, BMW M3 and Porsche 911. Vehicles competing in the category produced between 400 - 500 horsepower and were capable of speeds over 175-mph. Street Tuner (ST): This class was for smaller sedans and sports car with four or six-cylinder engines. Popular vehicles found in this group were the BMW 328i, Honda Civic Si, Porsche Cayman, Mazda MX-5, Audi S3 and MINI JCW. The cars in this class produce between 220 – 280-horsepower. 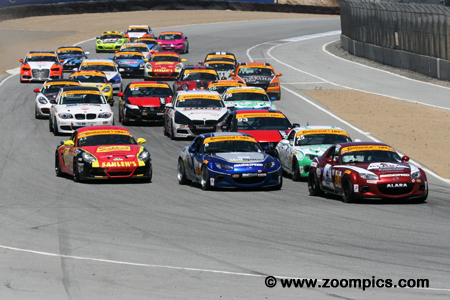 The third round of the 2015 Continental Tire SportsCar Challenge season took place at Mazda Raceway Laguna Seca. It was a support event to the Tudor United SportsCar Championship and shared the weekend with Mazda MX-5 Cup and the Lamborghini Blancpain Super Trofeo series. Forty-five entries would compete in the 2-hour, 30-minute race around the 2.238-mile eleven-turn road course. Twenty-eight Street Tuner cars head into Mazda Raceways corner two. Pole-sitter, Justin Piscitell driving the Alara Racing Mazda MX-5 is leads the group. Immediately behind him is the Freedom Autosport entry of Andrew Carbonell. 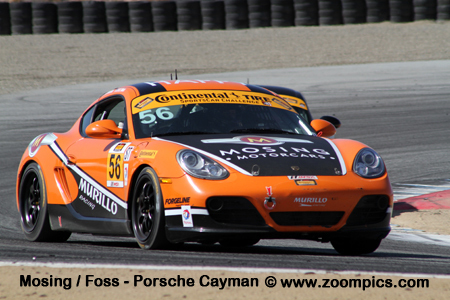 Also, challenging Piscitell is the Mazda MX-5 of Stevan McAleer and Jeff Segal in a Porsche Cayman. 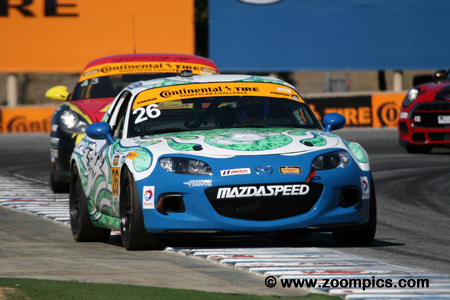 The Freedom Autosport Mazda MX-5 driven by Andrew Carbonell and Liam Dwyer started from the twenty-sixth grid position overall and eighth in the Street Tuner category. Dwyer was running twelfth in class when the team made the final pit-stop and driver change. Carbonell charged through the field and on the last lap he passed the Street Tuner leader to win by 0.247-seconds. The No. 6 Steven Motorsport entry was driven by racing veterans Andrew Davis and Robin Liddell. 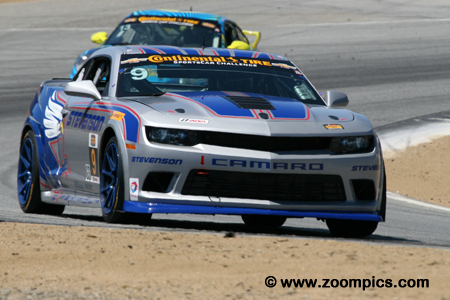 They started their Chevrolet Camaro Z/28.R directly behind their teammates in third. Their race strategist, Mike Johnson, decided to pit the car less than 30-minutes into the contest. As a result, their final stop was earlier than the top-three teams and when the leader pitted Liddell took first and held on to the checkered flag. Justin Piscitell was the fastest qualifier in Street Tuner - repeating his performance at the previous round in Sebring. 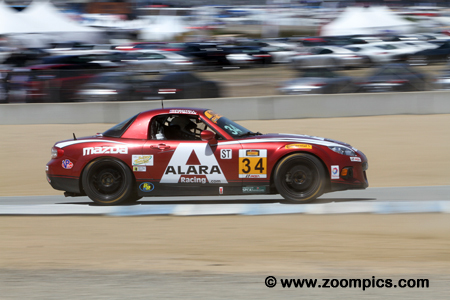 He shared the Alara Racing Mazda MX-5 with Christian Szymczak. 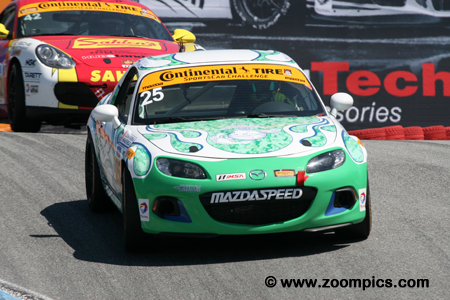 On the last restart, Szymczak was running second behind Street Tuner leader Tom Long is a Mazda MX-5. He was passed by a hard charging Andrew Carbonell and finished third in class. 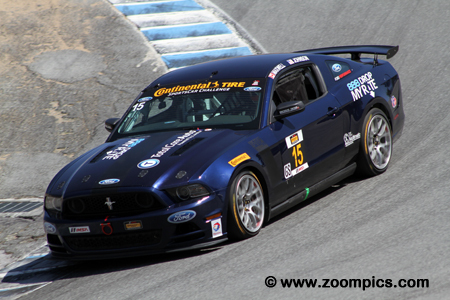 Multimatic Motorsports second entry was shared by the more experienced driver line-up of Scott Maxwell and Billy Johnson. 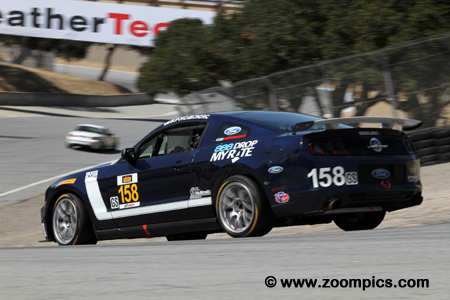 The pair started the Ford Mustang Boss 302R from the sixth grid position. With just over 30-minutes left in the race and fresh tires on the car, Johnson chased the two Stevenson Camaros and B.J. Zacharias in a Nissan. He was able to pass all but the leading Camaro and finished second. The second Freedom Autosport entry was driven by Britt Casey, Jr. and Tom Long. Casey qualified the No. 25 Mazda MX-5 third in the Street Tuner class. The team’s first pit-stop was quick and allowed Long to take a comfortable lead. A late race caution bunched the field and on the last lap, Long slid wide at corner nine - losing his momentum. He was passed by his teammate Andrew Carbonell and finished second. B.J. Zacharias and Brad Jaeger started seventh overall and in the Grand Sport class. In the final thirty-minutes, Zacharias was running fourth. On the final restart, he passed the No. 9 Stevenson Camaro driven by Lawson Aschenbach and moved into second. 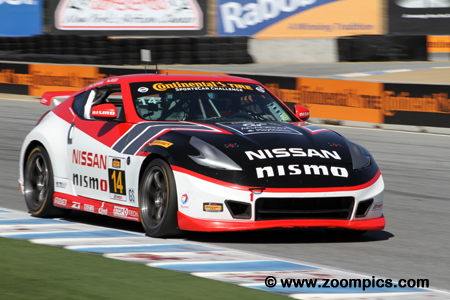 In the closing laps, Zacharias’ Doran Racing Nissan 370Z was passed by Billy Johnson and was third at the checkered flag. The No. 158 shared by Austin Cindric and Jade Buford started on the front row. The young duo ran in the top-five during the final hour. Buford and his Multimatic Motorsports teammate Billy Johnson made their last stop together. When Buford left the pits, he didn’t Johnson’s tires and hit them. Delayed by the incident, he finished seventh. Driving the No. 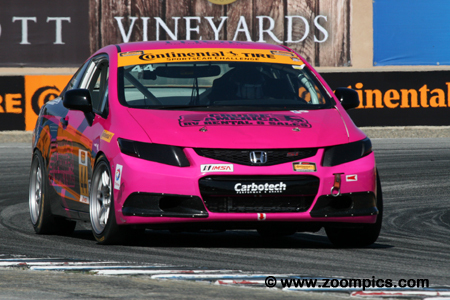 44 CRG-I Do Borrow Honda Civic Si was Sarah Cattaneo and Owen Trinkler. Cattaneo was fourth fastest in Street Tuner qualifying. With ten minutes remaining in the race Chad McCumbee ran wide at corner five and Trinkler picked up fourth place. He would hold the position to the checkered flag. Matt Bell repeated his Sebring qualifying performance – he started from the overall and Grand Sport pole. Bell shared the Stevenson Motorsports Chevrolet Camaro Z/28.R with Lawson Aschenbach. The pair led most of the contest but with 22-minutes remaining in the event, Aschenbach was instructed to let his teammate Robin Liddell pass. In the final laps, Aschenbach had to pit for fuel and dropped to a seventh place finish.